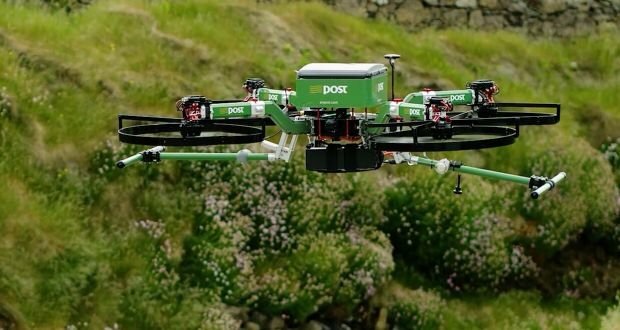 South Korea’s Ministry of Public Safety and Security has partnered up with CJ Korea Express, the country’s largest cargo delivery company, to develop and provide drones that can deliver much needed disaster relief supplies. This is the first time a private company will be given permission to start unmanned aerial vehicle services in South Korea. So far, three drones have been developed with 3 more in the pipeline. In the long term, CJ Korea Express hopes to capitalize on its emerging disaster relief operations experience to launch a commercial drone delivery service to remote and isolated areas as soon as the current South Korean UAV operation laws change. Midsized drone with four 3-bladed rotors. Up 3 kg (6.6 lb) of disaster relief goods via a cargo box or via a detachable container. A maximum altitude of 4,000 m (13,123 feet) and a 20 km (12.4 mile) flying radius. Up to 60 km/hr ( 37 mi/hr) for 70 minutes. What are your thoughts on the unmanned cargo delivery public/private partnership concept? Comment below!